Now this one is authentic. Sans the interrupting flavors of the vegetables and sun dried tomatoes. I really wanted to enjoy this as simply as I can. And as authentic as it should be, before I experiment with the ingredient bottarga in different ways. So following the original recipe, I smashed about 5 garlic cloves, and maybe 1/2 to 3/4 an ounce of bottarga in the mortar. I then heated some olive oil in a pan, and added the pounded bottarga paste. 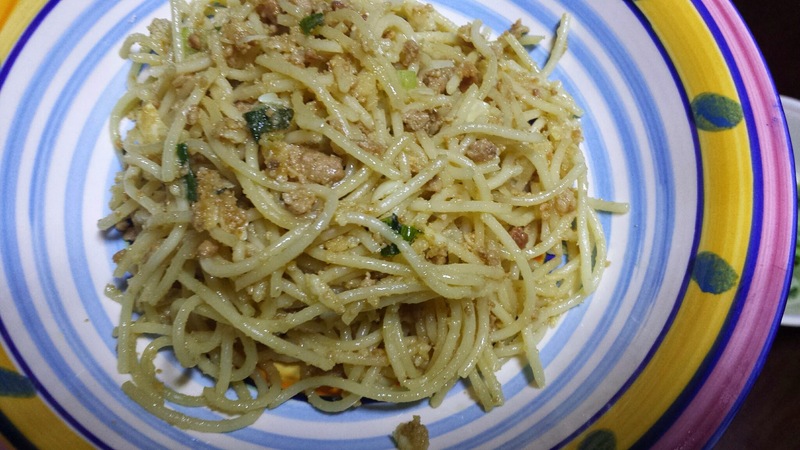 I tossed in the pasta, then added calamansi juice to finish it off! Done! I like this better because of the simplicity. it allows the flavor of the bottarga to shine through without fighting with the sun-dried tomatoes (the most flavorful in the spaghetti with bottarga and vegetable dish). This one is simplicity at its best.